Flame: Creative Children's Ministry: Joseph's coat in a box! 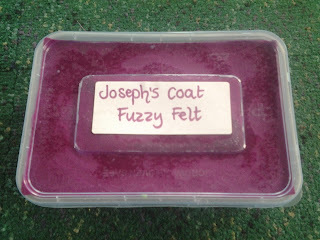 Joseph's coat in a box! We're putting together a Joseph story bag for the summer and it's been interesting planning what to put inside! 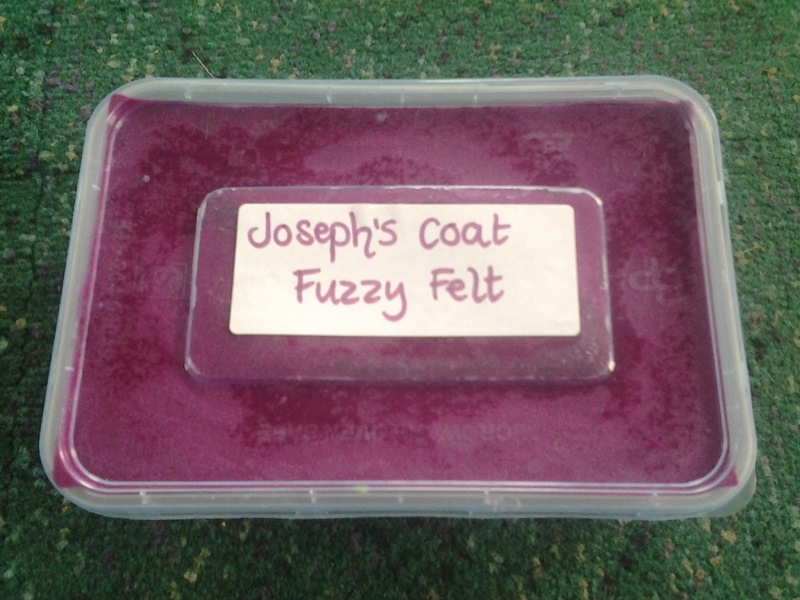 Of course, the most obvious part of the Joseph story is the bit about his fantastic coat. Genesis 37:3 states that the coat is 'a long robe with full sleeves', (or a 'decorated robe' in some translations), so we are justified in making it colourful- it does, after all, have to be something his brothers would envy! 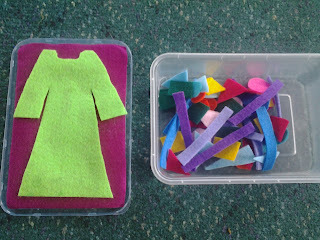 I wanted to make a fuzzy felt coat that the children could decorate and change as often as they wanted to so I was looking around for a stiff piece of board for my felt backing. I didn't happen to have any board, but I did have some of those cheap takeaway plastic boxes with lids and that seemed as good as anything else! I cut out a piece of felt to be my backing and stuck it to the bottom of the box lid (so it would end up inside the box when the box was closed). 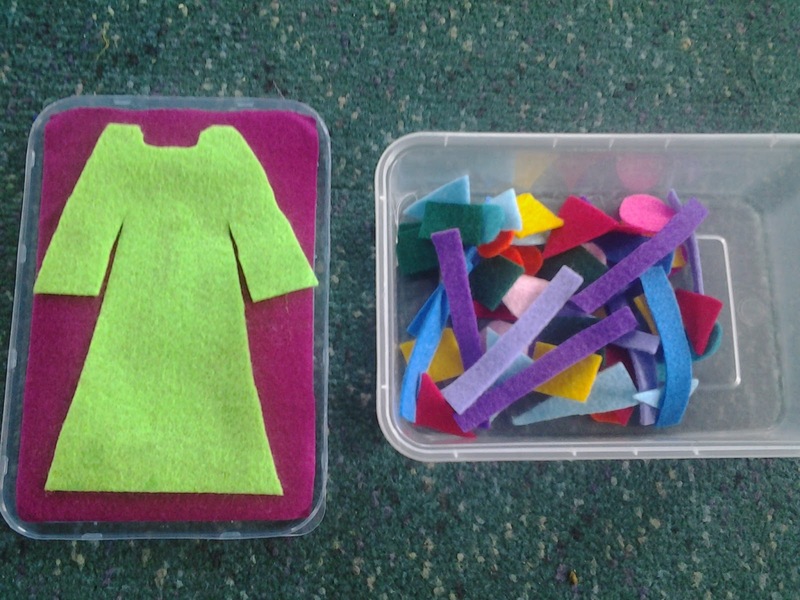 I then cut out a felt coat shape and stuck that on top of the backing and cut up some felt scraps and put them inside the box ready for decorating! It's great, because everything can be put back into the box and kept together all in one place. You'll never lose the board because it's in the lid! I'm about to post the Joseph story bag so keep your eyes peeled! Great idea for keeping all the pieces together in the box. Your ideas are so creative but practical at the same time. Looking forward to seeing the Joseph story bag. 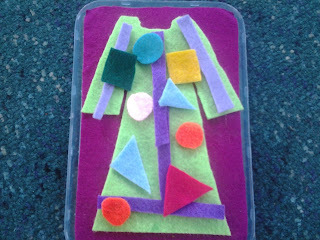 I love this for Joseph's coat! What a super idea :) I can't wait to try it out with my Sunday School class this week! Have a good time with it!